Rage has been a hot topic of late. In Good and Mad, Rebecca Traister chronicles the transformations that women’s fury has wrought on the American political landscape. In Eloquent Rage, Britney Cooper reframes the historically negative public discourse around black women’s anger by persuasively characterizing it as a “superpower.” And in Rage Becomes Her, Soraya Chemaly describes the infuriating cultural circumstances that women confront, the crippling problems that result when we don’t allow ourselves to feel anger about those circumstances, and the strategies we can use to channel our rage into action. Even while these books document the political and cultural importance of rage, however, maternal rage remains a third rail in public discourse. Good mothers, so many representations show us, embody love, not anger. And yet, many mothers find themselves furious – about the societal injustices that Traister, Cooper, and Chemaly chronicle and, sometimes, about the things our partners and children do. In one installment of her “Parent as a Verb” series on the website of The New Yorker, cartoonist Emily Flake asserts that “The emotion you really don’t truly, deeply understand until you have kids isn’t love. It’s rage.” She then illustrates “the petty, ridiculous hills that must be climbed every day you’re a parent,” including panels that depict her frustration over a shoe-wearing battle and her fury when her daughter kicks her in the shin. Much parenting media centers on advice. In large Facebook groups, moms and dads ask how they can handle tantrums or manage separation anxiety; on podcasts like Slate’s Mom and Dad are Fighting and Janet Lansbury’s Unruffled, experts respond to queries about how to get children to eat or sleep. The focus of Mom Rage is different. This podcast encourages parents to talk honestly about their emotional experiences. On one episode, a mom from Toronto called in to the podcast’s “Labia Hotline” to describe the “big, ugly, sobbing tears” that she cried one day when her teething 16-month old refused to nap. In response, Lepucki and Morris didn’t rattle off naptime solutions; instead, they empathized with the caller and acknowledged her way of processing. “I’ve always felt, as I’m mothering, this back catalogue of all the things I’m going to do when they’re away from me, and I always feel guilty about keeping that back catalogue,” Lepucki commented. “I … love your self-awareness…. I think it’s really good to know that [your mom rage comes out in tears], and it’s good you’re getting it out,” Morris added. Through the acceptance that the hosts offer to each other, to their listeners, and to their guests, Mom Rage seeks to bridge this space between parents. This is a podcast where, despite the fact that both hosts breastfed their children, their second guest was a mom who asserted that formula is feminist; where, when a listener who parents a biracial child wrote in to say that she was disappointed in the two white hosts’ propensity to “talk about talking about race,” Lepucki and Morris invited her on for an interview; and where the hosts can spend one week swearing off of time outs and the next acknowledging their occasional value. 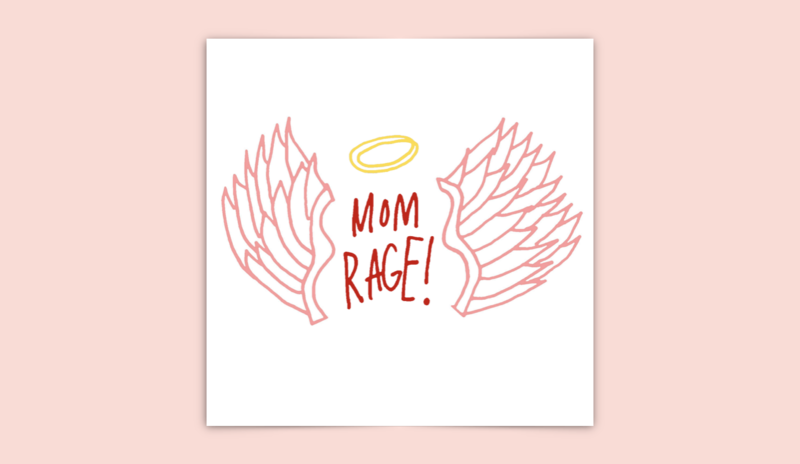 As a mother, Mom Rage has become a refuge for me, its tone a respite from the judgment that characterizes so many parenting spaces. I quite enjoy being welcomed back to Lepucki’s and Morris’s Rage. Loring Pfeiffer teaches English at Santa Clara University and lives in San Francisco with her family.